The standard Tyranid tournament list has emerged! The Tyranid Codex has only been publicly available for a few days and the final cut is quite different to the Tyranid rumours. However, the army is still every bit as dangerous as many of us imagined, combining a sea of tiny creatures with terrifying monstrous creatures that aren't just a threat in themselves, but augment the abilities of the lesser creatures. After complaining for a good half hour that the new Tyranid Codex was "a bit beige", here's the 1500 points army list that my friend and sometimes mentor (or tormentor) Neil Kerr came up with. Neil's biggest concern for the new Tyranid army is the plethora of melta guns and other high strength, low AP weaponry that's abundant in 5th edition Warhammer 40K. But, as the Tau seem to have a limited number of these, favouring lots of S5 basic weapons shots instead, I think the Tau might have a seriously problem, especially if all 3 of the burrowing monstrous creatures arrive on the same turn. In fact, it's these three monstrosities which are going to cause the biggest threat until the Tervigons are taken are of. The problem I see with this army is the Hormagaunts with Feel No Pain, the Tervigons with 6 wounds and all the burrowing monstrous creatures with 6 wounds each. Combined with a Toughness of 6 and a 3+ save, it's going to take all the firepower from my entire Tau army to bring one of those down in a single turn. Unfortunately, with 6 Turns in the game and presuming I don't take any casualties, claiming objectives will be out of the question. I could be all arrogant and say "Ha! 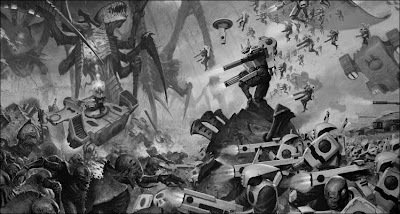 My Space Wolves will tear those foul xenos assunder", but this is my Tau blog and if the Tau can fight off Hive Fleet Gorgon in the new Tyranid Codex in a long campaign of biological evolution VS technical adaptation, then why can't they do so on the tabletop. The Hive Fleet Gorgon campaign in the Tyranid Codex is well worth a read for any Tau player by the way. So without melta guns and powerfists galore, what can the Tau do to put down this new threat? I keep finding myself looking at the more aggressive Tau armies people were fielding at the Grand Tournament in October, because it had more melta guns, plasma guns, railguns and markerlights, but only 2 Troops. It's a tough time for the Tau and other armies in 5th edition who are still waiting for their Codex. But anyone who's looked at Tyranid Codex will noticed some interesting new Tau Battlesuits illustrated fighting a Tyranid swarm. 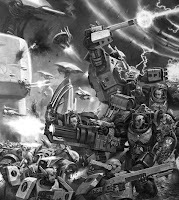 The Tau Firewarriors also have two shoulder pads and the Tau domed buildings are far more organic looking in a similar style to Adrian Smith's illustration of Space Wolves battling the Tau. Ha! I wouldn't be so quick as to say that my list is the new nid net list. Just because me, Exodite (you favourite battlewagon player Josh), Fallen Angel and Wanderingrogue have come up with a similar list. For Tau I think a return to the more traditional Fireknife setup is going to help as will the usual abundance of marker lights to remove cover saves and increase those plasma hits. Sure, it's a little brazen to declare this as "the list to beat," as if it was unstoppable, but I presume you're just throwing down the gauntlet to challenge others to make a superior list. I do find some odd choices in the mix, namely that you took no Zoanthropes, and the Mawloc love. Sure, when they hit, they can rough things up, but their odds of doing so aren't exactly good. The list is also decidedly light on shooty--so I'd be curious to see how it faired verses mech (let alone mech Eldar). I'm looking forward to see some batreps of the list in action. Adam has called it "the list to beat". In fact if you check my blog out you will see I am really not that impressed whatsoever with the new Nid Codex. It is a big step down in competitiveness compared to its predecessor. As I was discussing with Adam on MSN the new Nid book, and conversely this list, suffers massively versus all the current top tourney lists. Skcuzz - As I said, my Space Wolves can take that down. My Tau, I'm not so sure about. That list won't be that hard to beat as a Tau player. Mawlocs don't do that much damage to a meched up list, and tervigons aren't all that killy. Termagants will be a pain to take down with feels no pain, unless you are shooting them with your strength 6 blast from your hammerhead, or are shooting them with your fireknife suits. The problem with that list, is that it isn't fast enough to catch you. Yes, the burrowing guys will come into your lines right away, but you will get a turn to bring down the trygon prime before it assaults you. You should be able to take out 6 T6 wounds in a single turn of shooting with all the plasma/missle pods/rail gun shots. I'm going to be putting together a different looking tyranid list which is going to be MUCH more in your face on turn 2. It seems that this list is designed to transform the game into a battle of attrition. I for see this list working as such... Send in the hard hitters to tie up / distract the player from the fact that the Tervigons are sitting back, birthing more Termagautns to then over run the enemies lessened numbers. It's nothing more than a simple 'out produce and swarm' tactic. Take out the Tervigons first thing, followed by the big nasties and I bet the force will crumble. You also need to watch out for trygons subterranean assault. they can pull reserves from their tunnel. and tervigons can make termagaunts but when they roll a double they stop producing them so its not like they sit there and mass produce.